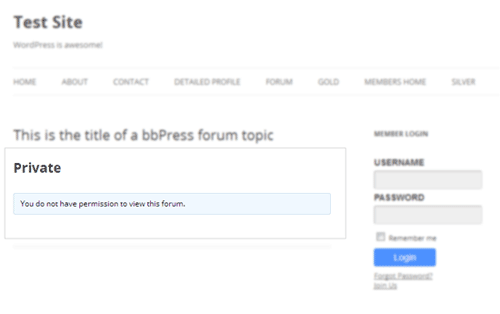 WP eMember (membership plugin) can be used with BBPress forum plugin to protect the content of your forum topics. Simply enable WP eMember’s WP User integration feature then choose one of the following protection options for your forum. This is the most widely used option when it comes to making your forum(s) member only. This option allows you to protect the forum and all the topics inside that forum for members of particular membership level. When you create a BBPress forum you can specify the eMember protection settings for this forum. WP eMember will only let members of the correct membership level (that you specify) to see the content of the topics that belong to the protected forum. To use this option, edit the “forum” in question from your admin dashboard. Then scroll down to the “eMember protection options” box at the bottom and choose your protection settings. If you want to keep your forum topics open and only protect a handful of topics selectively then this option will be useful for you. Keep your forum unprotected then edit an individual forum topic and set the eMember protection settings for that topic. 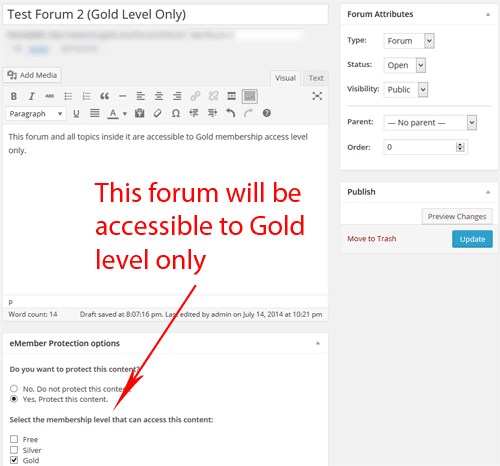 eMember will only let the members of the correct membership level to see the content of the protected forum topic. To use this option, edit the forum topic from your admin dashboard and choose the protection settings from the “eMember protection options” box. If you want to lockdown your forum area and make it to where only logged in members can view it, then this option will be useful for you.